I am sure a lot of parents are curious about how Montessori educators approach VELS. I would like to talk about how the Montessori method for writing meets VELS and also discuss the phenomenon of children's explosion of writing in my classroom. For example, children develop the control of movement and eye-hand coordination which will help them in writing. Pouring water from the child size pitcher to another, sewing wooden cards (later burlap), slicing apples, and carrying a tray of heavy clay, all involve precise hand and body movement. In the Sensorial area, children use knobbed cylinders which enhance their pincer grip. Tactile materials, such as touch boards and tablets, help children internalize the movement of lightness of touch, vertical strokes, and left-to-right movements. Children acquire the looseness of the wrist through the exercise of the geometric cabinet. This enables them to create smooth circles. It trains the eye for precise shape and the muscle tone of hand and finger for the preparation of forming letters. The Montessori classroom is a vocabulary enriched environment. Children practice precise names for all the objects in the environment. You will be astonished by how many they explore each day. Also, children are curious and seek for the knowledge of the real world. They always ask “what is that?” and “why?”. At this age children are in the sensitive period for real knowledge and they want adults to tell them what the object really is. In my classroom I read as much as we can from a wide variety of books about the world and nature, people and culture. A child is then introduced to activities more directly related to written language. The Montessori material Metal Insets make it possible for further writing exercise. Children are acquiring all the pencil skills necessary to form letter shapes. In my classroom it is one of the children’s favorite activities and it's always fun to observe their various combinations of colors and shapes. Then, slowly, the Movable Alphabet is introduced. With this material, children make their language “visible”. The teacher sounds out a three letter phonetic word such as “mat” while picking up each wooden letter from the compartment as she pronounces the sound. Then she places letters from left to right on the work mat. Soon the child begins to compose small stories on her own with the Movable Alphabet. The teacher does not correct words that are not properly spelled. The idea here is to only encourage her to express her thoughts. Then, chalkboard and paper writing can take place when the child becomes aware that writing is just another form of communicating. I hope that all families had a wonderful Thanksgiving holiday. The children enjoyed shaking heavy cream in a jar to make butter for the Stone Soup banquet and the Kindergarten children helped to arrange special centerpieces for the table. Winter seems to be here to stay, and the children have been happy playing and working in the snow. This month, as a way to connect the VELS with the Montessori experience, I would like to focus on the VELS element of developing foundational reading skills. Foundational Reading skills are one element of Literacy Development in the VELS. While humans are hardwired to learn spoken language, children must actively develop foundational skills for engaging with written language (both reading and writing). By the time a child completes Kindergarten, they should demonstrate certain print concepts, including phonological awareness, phonics and word recognition, and fluency. Age appropriate print concepts include understanding that spoken words are represented as written words by a unique sequence of letters and that individual words are separated by spaces, tracking print left to right and top to bottom on a page, and recognizing the name of all upper and lower case letters. From the moment a child enters the Primary Montessori classroom, the environment and lessons provide direct and indirect preparation for the print concepts needed for literacy development in Kindergarten and beyond. Materials and lessons are organized to mimic the movement of our eyes when tracking print on a page. For example, when a guide demonstrates the use of a material, she sets up the activity so that materials are used in a logical order from left to right and top to bottom. 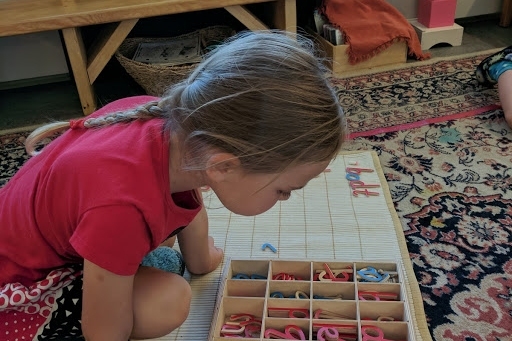 Long before a child begins formal language lessons in the Montessori classroom, their eyes and mind are learning to instinctively organize movement from left to right. Children can be much more receptive to certain language concepts prior to Kindergarten. Children of all ages play the Sound Game in the classroom, similar to I Spy using the sounds in the name of objects, which helps children to hear the component sounds in words. Young children may only hear the first sound in a word, but older children practice vocalizing all the sounds in order. We begin teaching phonemes (letter sounds) as soon as a child demonstrates they can isolate the first sound in a word. Often, this is when a child is three or four. Phonemes are introduced in the Montessori classroom with sandpaper letters, which do double duty by teaching both the letter sound and the tracing pattern for writing the letter. Parents may notice that Montessori guides emphasize the letter sound much more than the name of the letter, since this is more useful for literacy development. The sandpaper letters are the first hint offered to the child that written words can be used to represent spoken language. These foundational skills are utilized when a child begins composing words with the Moveable Alphabet and when writing letter symbols with chalk and pencil. Their hands have practiced tracing the shapes months before using a writing utensil to copy the symbols. They have also ideally internalized the sound associated with each symbol. When they are in Kindergarten, or even younger, they are prepared to ‘hit the ground running’ with reading. You can support development of foundational reading skills at home as well! In addition to reading aloud regularly with your child, you can play games that will help your child begin to notice letters in the world around them. Look for letters on signs as you drive around with your child. You can also try creating an alphabet book with your child, drawing or pasting pictures from magazines for each letter. Try playing the Sound Game at home: isolate about ten familiar objects and say, “I’m thinking of something that starts with the sound…….” If your child has a hard time with ten objects, you can isolate a few in your hand to make it simpler. An older child may enjoy family game nights with Boggle, Scrabble Jr. or Bananagrams. And remember to keep it light and have fun!